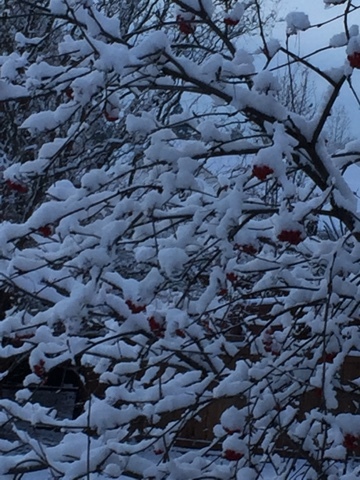 The Simple Life of a Queen: Let it Snow! Good morning! This is the season for giving and I want to share some gifts received recently. I thought I would start out by sharing a little gift that I received from Sherri at Sherri's Needlecrafts on my sidebar. 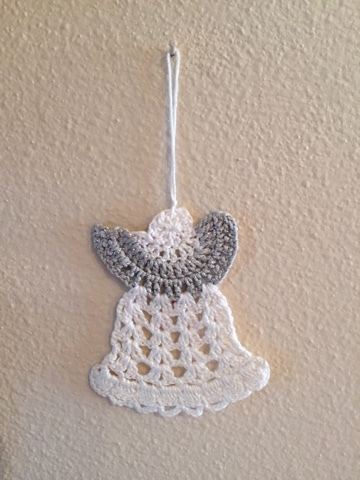 Isn't this little crochet angel the sweetest? She has a sparkly yoke, or as Piper would say, "Farkley"! I collect angels and think this little one is darling. Thank you so much Sherri. 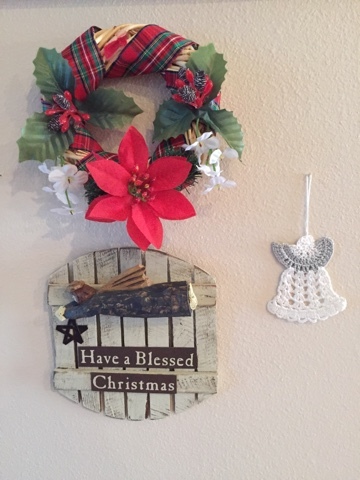 For the holidays she is living with this wreath and plaque. I told you in my last post that Dayle and Teresa Kasner sent me a check for yarn to make mittens for the children. This is what I was able to buy with their gift. Each skein will make 3-4 pair of mittens. Thank you so much Dayle and Teresa. Your gift will help warm LOTS of little hands. Each skein is a different color so the children will have lots of choices. Mandy and Brad have a sweet neighbor named Kat. She and her husband gave Piper these stuffed stand up figures while they were it taking a walk with Grandpa last week. The are called "nissers"...I think I spelled that right. The little girl has "Piper" embroidered on her foot and the little boy is "Evan". They thought it was appropriate to give them to Piper as they were downsizing their decorations. Wasn't that thoughtful? They are so cute and have lots of jingle bells on them. Now, a study in contrasts. 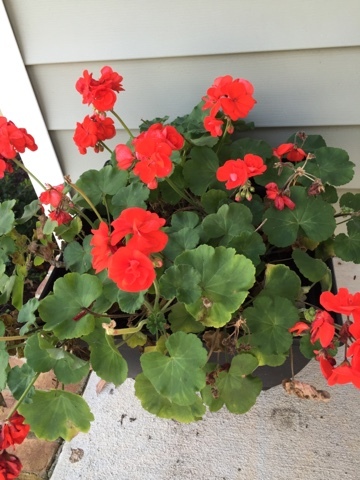 These geraniums are still blooming on Mandy's porch. I took this picture on Saturday. This is our backyard today! We received 4 inches of snow yesterday, with another 4-8 predicted for this afternoon through tomorrow morning. It beginning to look a lot like Christmas! Mt. 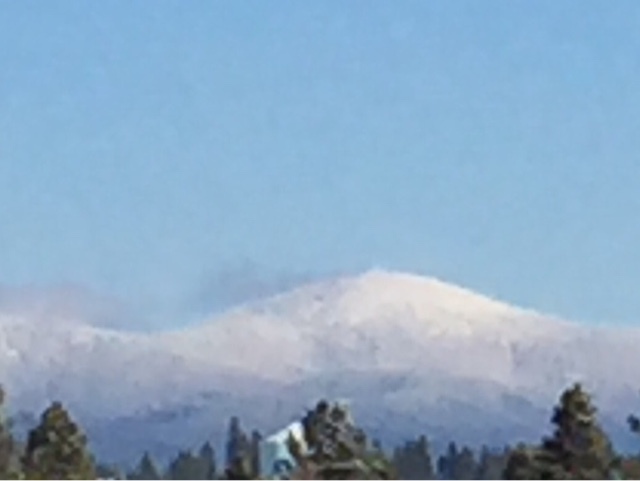 Spokane yesterday afternoon. Blurry because of the distance with my IPhone, but still pretty. We have an artificial Christmas tree that we usually put in the living room. We very rarely spend time in the living room unless we have company and I didn't want to put the tree where we couldn't enjoy it. Most of our time is spent in the basement den where our books, television and fireplace are. Our tree was way too big for this area. Monday night we were shopping and saw this little tree for $39. It's 6 1/2 feet tall and perfect for this space. My chair is right next to the little bookcase you see on the left. The bookcase holds some of my patterns and current projects. Chloe's bed is on the right, in front of the fireplace. Last night I turned off the lights and just sat and enjoyed the tree. I think I'm going to like having a tree down here. 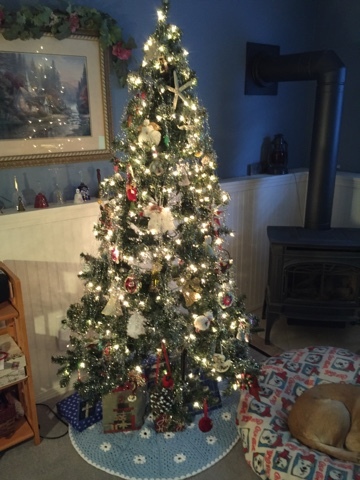 We'll keep the bigger tree for the years that our kids come home. Do you like my granny square tree skirt? It was a lot of fun to make with graduated, pie-shaped granny's. 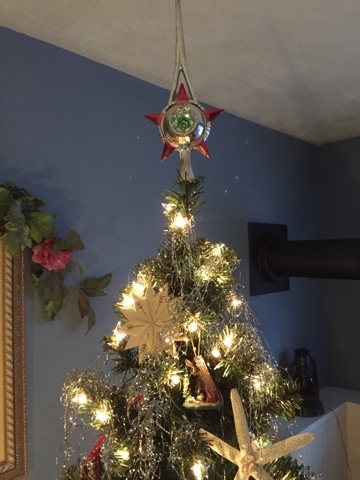 The star on top of the tree is the one that was on top of Dennis' parents tree from the year he was born. When we married, his Mom gave it to us and it's on top every year. It's a bit battered but we love it and it holds a lot of memories. The little nativity you see underneath it was given to me by my kindergarten Sunday school teacher 50 years ago! It holds a place of honor every year on our tree. We thought we were going to be alone for Christmas like we were for Thanksgiving, but our best friends, Neal and Jenny are alone this year too. All three of their children will be elsewhere for the holidays too, so we're going to share our Christmas dinner together. Afterwards I'm sure we'll have a rousing game of dominoes! We are some wild and crazy people. :-). Yesterday I baked more sugar cookies with the same recipe I used with Piper last week. We face-timed while I frosted them. I sure missed her help while rolling and cutting out the cookies. There will be a plateful tonight for Bible study. I hope everyone enjoys them. I hope you all have a lovely weekend my friends. A generous gift indeed with all that yarn. The children certainly need mittens with all the snow you are having at the moment. So nice that you will have company for your Christmas dinner. Take care. What a great post, Betsy! You sound quite happy and chipper and I love that you got a tree for your den! It's gorgeous and will bring you much cheer. I'm glad that you will have friends for Christmas dinner and games after. I love all the yarn you were able to buy and the colors, too. Can't wait to see the mittens start to pile up! LOL! 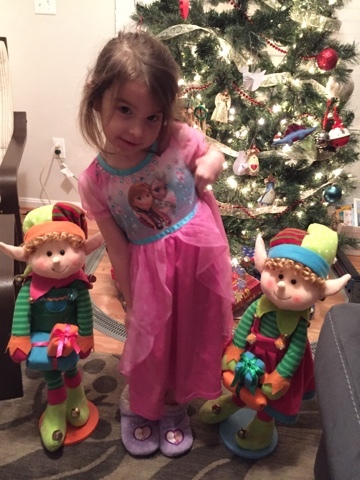 Piper looks adorable with her cute little elves.. and your snow! Wow.. so pretty! I do hope we get SOME snow this year. Will miss you especially tomorrow.. The snow is very beautiful Betsy. I am glad you will be sharing your lovely Christmas dinner with cherished friends. 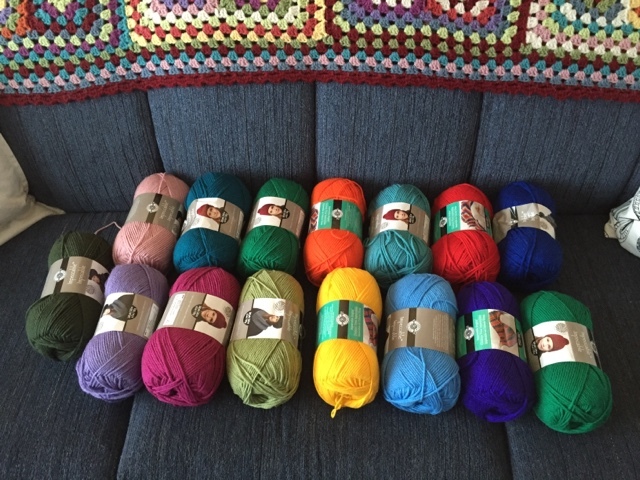 Teresa and Dayle are just the best, that yarn is perfect for your wonderful project.